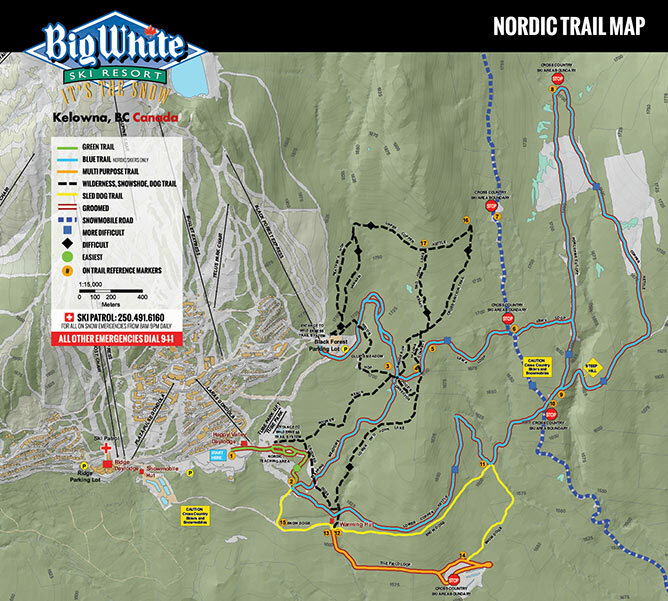 Big White is home to a total of 25 kilometers of Nordic and Wilderness trails. 14 kilometers of which are Nordic trails that are groomed daily and track set. Whether you are at a beginner or an advanced level, there are plenty of suitable trails to try! Nordic ski equipment Rental equipment is available from the Village Center Mall, and all users must have a valid Trail pass, Alpine ticket, or Season Pass. There are hot snacks and beverages available to buy in the Happy Valley Day Lodge as well as heated washroom facilities.